services, suitable for every kind of taste. 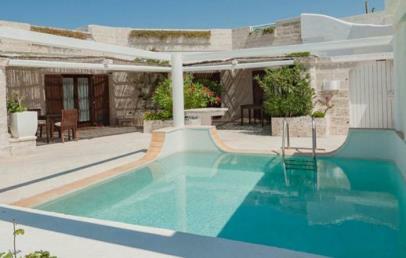 La Peschiera is an exclusive five-star luxury Hotel & Resort, located on the Adriatic coast in Apulia, on the coastal of Monopoli-Savelletri and about 65 km from Bari-Palese as well Brindisi-Casale airport away. Realized on a fishing farm, which dates back to the Bourbon period, the Peschiera Hotel & Resort is located on a privileged location overlooking the sea, in a region of great historical and artistic interest. The 13 rooms are comfortably furnished and divided into different categories: Pool, Sunrise, Sunshine and Panorama. The rooms have a private patio overlooking the pool or an elegant private terrace overlooking the sea, where breakfast it’s usually served. For the health and welfare of its guests, La Peschiera Hotel & Resort offers a wellness program with several alternatives: a heated swimming pool, a long whirlpool bath, a revitalizing corridor and personalized massages for the relax of body and mind. In addition if guests wish, they can visit the Spa of the nearby Hotel "Il Melograno", that offers a Turkish bath and an indoor swimming pool. At La Peschiera Restaurant guests can enjoy an excellent cuisine based on typical local dishes; pride of the menu, are of course, the delicious dishes based on fresh fish and seafood, served in a charming location with a warm atmosphere, breathing the sea breeze and being immersed into the sound of waves crashing on the rocks. The dishes are wisely combined with a careful selection of the best national and regional wines. The children are welcome from the age of 10. Elegant and large room equipped with modern comforts. It has a bedroom and a living area with sofa bed and two bathrooms with shower or tub, hairdryer, complimentary toiletries, bathrobes and slippers. The rooms face a terrace with swimming pool or sea view. Elegant and simply double room furnished and equipped with modern comforts. The private bathroom has shower, hairdryer, complimentary toiletries, bathrobes and slippers. The rooms have a patio with swimming pool view and a terrace over the sea. Elegant and large room equipped with modern comforts. It has a bedroom and a living area with sofa bed and two bathrooms with shower, hairdryer, complimentary toiletries, bathrobes and slippers. 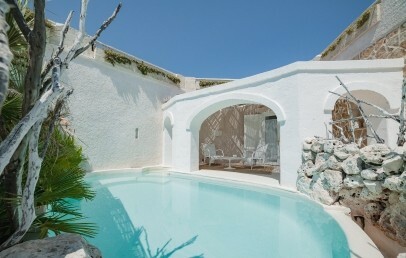 It offers a private terrace with pool and with beautiful pool and sea view. Elegant and large room equipped with modern comfortsas a Nespresso coffee machine and Wi-Fi connection free of charge. It has a bedroom and two bathrooms with shower, hairdryer, complimentary toiletries, bathrobes and slippers. It has a an equipped patio on the pool side and a window with sea view. 5% reduction for stays in April! Services included from June 11th to September 30th: private beach (2 sunbeds), beach towels and sauna. Included services: shuttle service to the SPA of Il Melograno Hotel, admission to the indoor pool, free use of the tennis courts, paddle, wellness program starting from 18 years old.